DVD #2 Host: Mark Kuhar; Poets and Friends: Russell Salamon, Tom Kryss, D.R. Wagner, Kent Taylor, Ingrid Swanberg, George Fitzpartick, rjs (via taped interview). 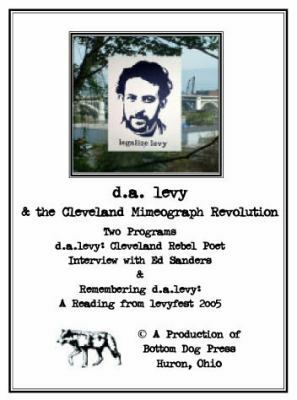 Each of these members of the Cleveland Mimeograph Revolution and intimate friends of the poet reads from a d.a.levy poem and shares memories of the poet and the late 1960s era. alevyfesta held at Cleveland State University, Oct. 29, 2005, co-sponsored by CSU Poetry Center, CSU Special Collections, Deepcleveland.com., Bottom Dog Press, and the Ohio Humanities Council. 65 mins Production by The Camera Guy Video Productions, Sandusky, Ohio. *Some poems contain explicit language.